Refer to the highlighted, lettered points for detailed information about each section of the statement. View example statement (pdf). A. Amount due is the total due including the addition of any previous balances. B. Send payments to this address, not the return address. C. List of procedures completed by your dentist or hygienist. 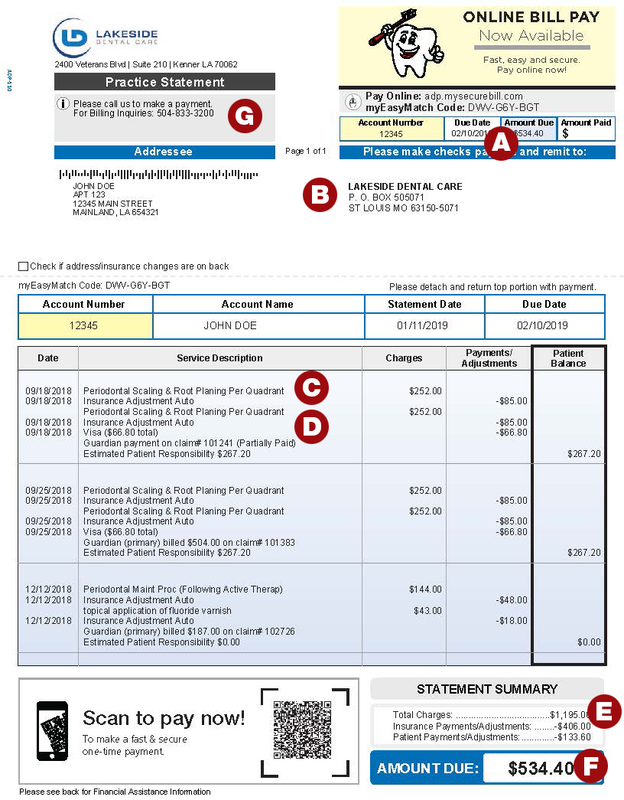 The associated cost for each procedure will be shown in the CHARGES column. D. Any payments from you or your insurance provider will be shown in the CREDITS column. E. This area shows current totals due and any previous balances. F. You will be presented with a total fee balance, any estimated insurance payments provided by us and an estimated payment due. G. If you have any questions about your statement, please call this number and ask for the practice manager.